Eat, relax, connect, and pass the values. Today’s families are on the go! But it turns out (no surprise) that one of the best things you can do for your family is to slow down, relax, and connect over a meal. It is around the table that families connect and hear each other’s stories. It is around the table that our faith and values are passed from generation to generation. This has been true for centuries, but in the last generation, for the first time in human history, it is not normal to gather around the table to share conversation and food. And we’re paying a price with kids who feel stressed out, anxious, and disconnected. So how, in today’s age of numerous activities and busy lifestyles, can we honor this age-old principle for passing faith and values over a meal? What does this look like from a practical standpoint? Jan and Dean are a fairly typical family. Passing their faith and values to their kids is important to them, but they lead very busy lives. Jan and Dean are both self-employed, and their three kids are all involved in various extracurricular activities. Just coordinating pick-ups, drop-offs, carpools, and some fashion of nutrition requires a Herculean effort. Until recently, meals were often eaten in the car or in drive-by fashion at the kitchen counter during transitions. Feeling committed to both the extracurricular activities and the sharing of meals, the family made a plan together (really great to do this with kids, not to them). Jan and Dean make sure that after school snacks are filling, which eliminates the need for dinner at their usual 6 pm time. They gather at 7:30 or 8:00 (when the kids wrap up their activities) and share a light supper together, catching up on the highlights of the day and taking time to discuss important life lessons. During a recent 8 pm supper, while the family shared fun conversation, the question was posed, “What was your favorite time of the day?” One child was quick to answer, “My favorite time is right now!” The other kids chimed in their agreement. Mission accomplished! The kids enjoy the time together and are embracing their parents’ values. 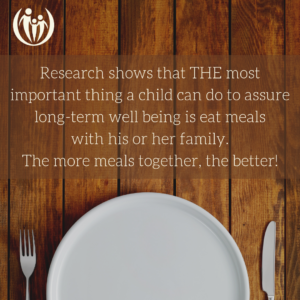 Once you figure out a schedule for meals together and get the kiddos corralled at the table, how can you maximize the value of those times? How can you pass the values and faith while you pass the veggies and bread? Technology has brought media and your kids’ peers into your home and your kids’ pockets nearly 24-7. 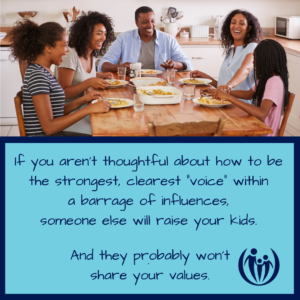 If you aren’t thoughtful about how to be the strongest, clearest “voice” in this barrage of influences, someone else will raise your kids. And they probably won’t share your values. Use meal prep to start passing values before the food is even on the table. When kids help prepare a meal it builds a value of healthy eating as well as serving others. When you express your appreciation for the help it sets the stage for warm interaction at the table. Jesus ate with a wide variety of people without bringing up their past (Luke 7:34). Apparently Jesus didn’t use dinners as a time to address his companions’ sin, because they kept wanting to join him. A connective tone is essential for passing values during dinner. It is not the time to bring up the D’s on Junior’s report card or require him to down those brussel sprouts! 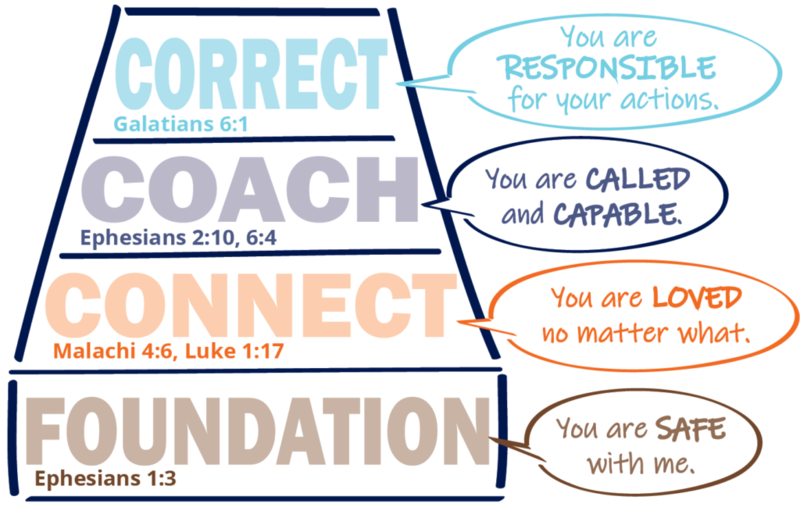 As much as possible, focus on positive connection rather than reprimands and reminders. This Peaceful Mealtimes document is helpful if power-struggles about sitting still and eating a healthy meal are spoiling your dinners. 3. Create a distraction free zone. Many families try to kill two birds with one stone by eating and catching up on the news or a favorite show during mealtime. However, this is almost always counterproductive to connecting as a family. It’s vitally important to create a “distraction-free” zone. When parents are the first to put their phones in the “time out basket” and turn off the TV, it makes a strong statement that everyone at the table is valuable and worth listening to. “What was the bravest thing you did today? Over the years, these meaningful mealtime discussions will impact your kids’ values in profound ways, even though it might feel awkward at times to talk about character and faith. But what do our kids really wish they could talk about at the table with us? “Religious matters” is the topic that the greatest percentage of teens (more than half) say they wish they could honestly discuss with their parents over meals. Note the wording – “honestly discuss”. Trying to dump your thoughts and ideas on them will set off the lecture-alert bells in their brains. Instead, ask questions about their thoughts and ideas. Or set the stage with some honesty of your own about a spiritual struggle you have. Parents, YOU are the most important people in your kids’ lives. If life circumstances have kept your family from enjoying meals as often as you’d like, try keeping it simple with just 2-3 family meals a week. Mealtime doesn’t have to be long and complicated (or even at dinner!) — sometimes short and sweet is what works! Try giving it a shot and claim the rich heritage of Jesus’ example. Eat, relax, connect, and pass the values! 84 starter-questions from Connected Families you can use anytime. Take 10 to 15 minutes to find out your strengths and challenges with our free parenting assessment.